Headline writers are obscure people, aren’t they? I suppose I must include myself in that description, therefore, for the above. But basically this is about two Facel 11s which both began life in Crawley in West Sussex, GB, or nearby. The first was originally owned by Jack Bowthorpe who had quite a big electronics firm in Crawley, which still exists in the name of Spirent. He took delivery of HK2 B152 on January 1, 1964 and it was originally registered 5GXV. 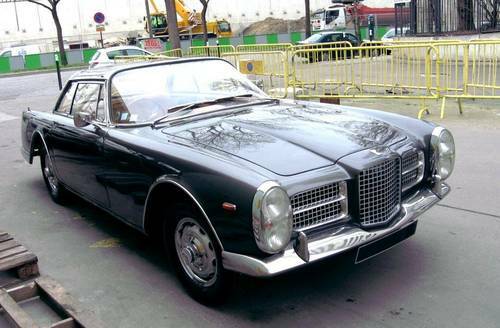 It was automatic, and the only other Facel 11 apart from mine to be painted in Brunswick blue with grey interior. It had quite a chequered history, in that it was then sold to Anton Von Kassel who was Greek-born dealer in icons, and had a gallery called New Grecian. He was noted for having an affair with Alexandra (Sasha) Bruce whose father was US ambassador to the UK; a book was even written about her. Later the car went to Ron Fry who sprinted Ferraris and a GT40, and it was also owned by Richard Stevens. In January 2013, it was up for sale, having been restored by Lecoq, for a massive €330,000/£275,000. It was owned by Riquet(F) in 1990 then possibly Amicale member A Bels. During its Lecoq restoration, it was repainted grey and acquired a plaque saying that it had been restored by them. They seem to pride themselves on doing the very best. However, still unsold, in September 2014, the car was again for sale at £353,000! Now, in April 2015, the price is down to around £190,000, which finally makes it realistic. A few miles west resided HK2 A172, delivered around 18 months earlier to John Bellord who, with Sidney Miller, ran Honeywood House nursing home near Horsham. They were academics and very religious, but with a taste for fast cars. They would have Aston Martins and Mercedes as well as the Facel, all on hire purchase which they discovered was a neat way to get large amounts of cash. Even so, at one time they owed Intercontinental Cars around £160,000. Four clearing banks and 14 finance companies were involved. The pair were particularly infamous for a company called Southern Organs (and various related companies) which seemed to sponsor everyone in motor sport in the early 1970s. Indeed, Dave Morgan even attempted to qualify a Surtees at the British Grand Prix with Southern Organs backing. But it was all an HP scam. Churches were not allowed to sign HP agreements when purchasing organs, so Bellord and Miller got racing drivers to sign for them in return for some cash. However, it soon became apparent that the HP companies weren’t getting their repayments and the churches weren’t getting their organs and it was all bound to end in tears. Bellord and Miller disappeared – the whole tale is told magnificently here https://www.authonomy.com/book/50775/#chapter by Geoff Green – only to resurface on a Scottish island and eventually be convicted of fraud. The Facel was owned by John Barton and later a John Hall and more recently by Andy Kirkham in… Crawley. It hadn’t gone far. Interesting read particularly as I own a 61 Jaguar E Type that was owned by Miller and Bellord.